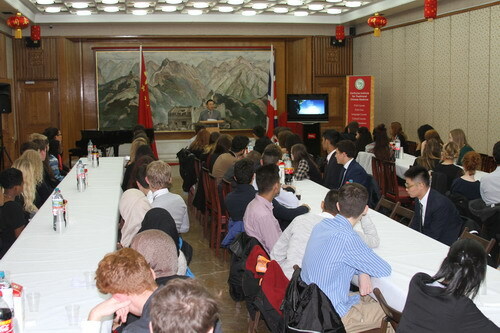 On 12 November, the Chinese Embassy held a special event called “China Day” for Drayton Manor High School. During the first part of the event, nearly 80 students of the Drayton Manor High School, led by Ms. Deborah Yates, Head of Business and Economics and three other teachers, arrived at the British Museum at 9 in the morning for a private view of the exhibition “Ming: 50 years that changed China” arranged by the Embassy. The head of Press and Public Affairs Section of the Embassy and Ms. Jessica Harrison-Hall, curator of Asia Department of the British Museum, greeted the teachers and students at the lobby of the Museum, and briefed the group on the schedule of the “China Day” event and the exhibition respectively. Ms. Jessica Harrison-Hall provided information on the exquisite objects on display and gave a detailed the introduction of economic, social, cultural and diplomatic achievements of China during the Ming Dynasty. In the exhibition hall, the group viewed with great interest and admired the original painting and calligraphy of Emperor Xuande (reigned 1425-35), the magnificent ink-on-silk painting Ming Emperor Xuande Relaxing Outside with His Attendants, the elegant porcelain flask with underglaze blue decoration and lotus design, and other exquisite porcelain, gold ornaments, jewelry, furniture, sculpture and silk artefacts. The teachers and students also visited the China and Chinese jade galleries. Later, the group arrived at the Chinese Embassy and was greeted by Minister Ni Jian. In his welcome speech, Minister Ni characterized the day’s event in three words starting with the letter “C”, China, Culture and Communication. “First, it is a Day about China. China is one of the most frequent words that you may read or hear about from newspapers, television and radio. But what about China’s past and present? What is the social and economic landscape? You must be curious to know more. This is why after discussions with Drayton Manor High School, we have decided to host today’s event about China especially for you. We hope you will have a close-up understanding and hands-on experience about China through exhibitions, briefings, martial art performance, Chinese calligraphy, tea art and Chinese food. I hope you will focus more on China and deepen your understanding about the country after today’s event. Second, it is a Day about Culture. 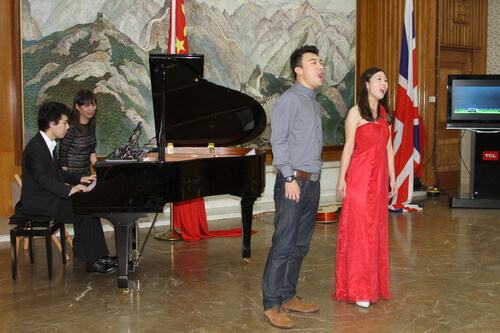 Both China and the UK are cultural giants and the cultural exchanges between the two countries constitute an important part of bilateral friendships. You visited the British Museum’s Ming exhibition, China and the Chinese jade galleries earlier this morning. In a short while, a few young Chinese performers will perform Chinese music and songs. We will also have talented students from Drayton Manor to perform British songs. Indeed it will be a unique opportunity of cultural exchange from which you will enjoy and experience the cultural similarities and differences between our two countries. In conclusion, Minister Ni wished the guests a pleasant and memorable day in the Embassy. Chinese diplomats from the Press and Public Affairs Section and the Commercial Section of the Embassy gave presentations on China’s history, culture, economy, and social development as well as its relations with the UK, using videos and pictures. After a delicious Chinese-style lunch, Yang Yuanfan, an ethnic Chinese and winner of International Franz Liszt Competition for Young Pianists in Weimar, and excellent young singers Jessie Tse and Wang Bo played and sang famous Chinese and foreign songs, including Yellow River, Spring Dawn and Libiamo ne’lieti calici. 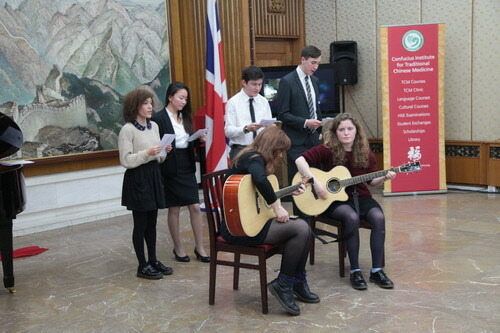 Students from Drayton Manor High School sang popular English songs Imagine and Wonderwall, and gave piano and guitar performances. Under the instruction of martial arts teacher from the Confucius Institute for Traditional Chinese Medicine at London South Bank University, the students got an opportunity to learn basic movements of Tai Ji and martial arts and enjoyed the process. 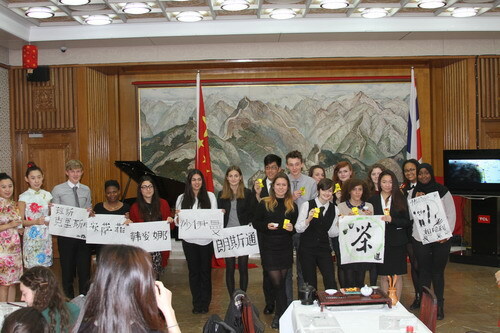 In the following workshops, the students had their first-ever experience of using a Chinese writing brush, making Chinese tea and creating a Chinese painting. They also practiced writing their Chinese names given to them by diplomats of the Embassy and teachers from the Confucius Institute. When it was time to go, everyone wished there had been more time. Before conclusion, Ms. Deborah Yates and Jack, President of the Student Union, spoke on behalf of the Drayton Manor High School. They expressed appreciation to the Chinese Embassy for the China Day event, which was enjoyable, fruitful and impressive. They were ready to follow the development in China and China-UK relations more closely and build stronger ties with the Chinese Embassy and Chinese schools.